University of Guelph researchers have published what is believed to be the first scientific paper in North America on improving medicinal cannabis plant production, helping move the industry into the realm of high-tech laboratories and evidence-based practices. "Growing marijuana has been illegal for so many years that there has been hardly any scientific research up until this point on how to produce this crop," said Prof. Youbin Zheng. "There has been no science guiding this industry." Zheng, along with Prof. Mike Dixon and PhD student Deron Caplan, investigated optimal fertilizer rates and soilless growing substrates required to grow cannabis plants that have higher amounts of medicinal components and greater yield. The study, which was funded in part by Natural Sciences and Engineering Research Council of Canada, was recently published in the journal HortScience. It is the first of a series of U of G studies investigating ideal horticultural practices for indoor cannabis production. "The University of Guelph is one of the top universities in the world for horticulture research, particularly for controlled environment plant production," said Zheng, who holds the environmental horticulture chair in the School of Environmental Sciences. "We have the cutting-edge technology and the expertise to lead this area of research, and are well-positioned to train horticulturalists for the rapidly growing cannabis industry." 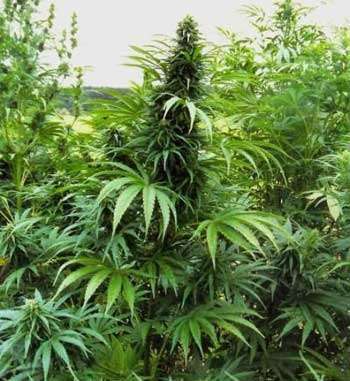 The University has been conducting medicinal cannabis production research for scientific purposes for several years, Zheng said. Proposed legislative changes have resulted in more licensed growers seeking expertise. "This has enabled us to have a more intense focus on this type of research." The newly-published study focussed on plant performance during the vegetative stage. The researchers determined the optimal amount of fertilizer and developed two soilless growing substrate recipes to produce high-yielding plants rich in cannabidiol and THC - the two primary medicinal components. A second paper, soon to appear in HortScience, examines ideal fertilizer rates and growth substrate conditions for the plants at the flowering stage. The team of researchers are now studying lighting and irrigation to grow high-yielding, quality cannabis. "Controlling the light spectrum, for example, provides the opportunity to standardize the concentration of cannabidiol, a chemical component in medical marijuana that appears to cause no intoxicating effects," said Dixon, director of the Controlled Environment Systems Research Facility. "We have this unique expertise and now we can apply it to an area that has yet to be scientifically explored." Yes..I did a great deal of this already. Except that I live in poverty and used my own income to pay for it. Lets talk when I get access to the same means of production they do. What I did with what little I have is more substantial indicating my skill level.